Ooooo...those pompoms and velvet trims are making me drool! Lovely stuff! Oh Andrea...so glad to see you are back. I'm sure there are others that have missed your wonderful presence here while you were in Texas. I could tell you a story or two about flying with a little one!! And about that light blue pom pom trim...might have to beg you for a piece of that. loved your package of goodies. i collect vintage birthday candles because I love the graphics on the boxes too! (plus the cool old colors of the candles) I have a large jar that I have them displayed in year round in my kitchen! A kindred soul. yippee yi yo ki aay! glad your back, and all is well. what a score on that ribbon~thingy, very nice! can't wait to see what u'll share next! 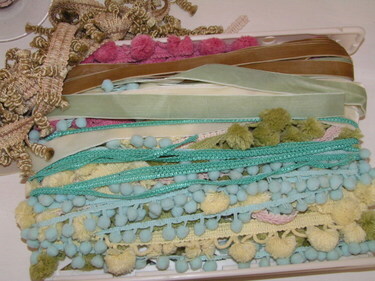 The trims are simply beautiful....now what are you going to do with them? Welcome home Andrea. 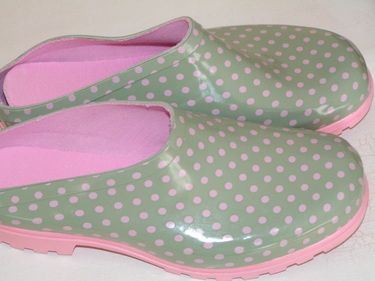 Love those polka dot garden shoes. 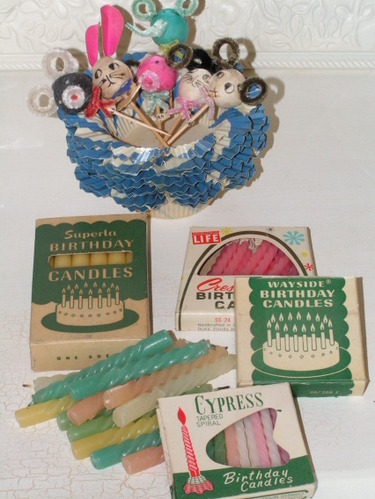 I never thought of collecting old birthday candles! What a super idea. They would look awesome in a jar. Our Joanns is huge like that and I could spend an entire day in there I'm sure. sometimes our guys just don't get it! Wow - I'm in awe of all your beautiful trim. I'm crazy for all those pom poms. Glad to have you back. 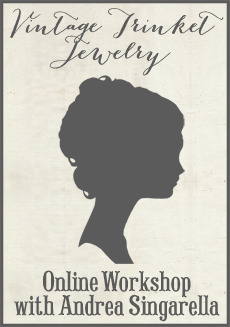 Just found your Blog and I LOVE it! Your trims are making me want to go shop!! Hobby Lobby is a great store..and the super JoAnnes! Don't you just LOVE the decorator fabrics? Oh My! 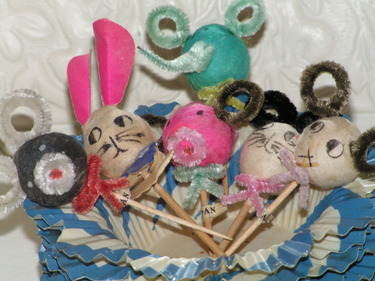 I think your spun cotton cupcake picks are great too! And all of that wonderful trim...look forward to seeing what you create with it all. What a lovely eye-candy filled place to visit!